We have macaroni & cheese with broccoli (my little girl's favorite!) 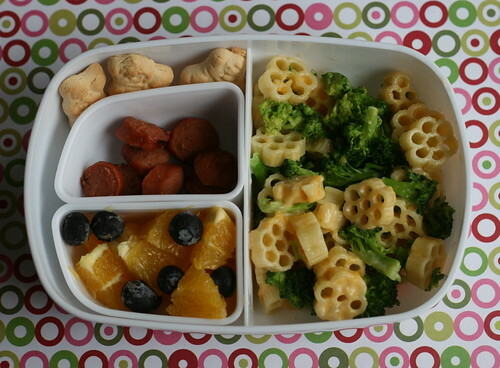 on one side, hot dog pieces in one dish, orange chunks and blueberries in the other small dish, with some of those everlasting Pooh cookies stuck in the side. Wanna guess what the one food item she didn't eat was? Those *&$%#@! Pooh cookies! I think it's time to find them a new home. If I can't find a teacher at school to take them we'll feed them to some ducks or something. Sheesh. Well, I guess it's good that she is happy to eat her veggies and fruits and ignore her cookies right? Hope you can find them a good home! I am very happy she's such a good eater! Broccoli is one of her favorite foods! :) Those darn cookies though! What a waste of $8 that was. Oh, Alie, I'd happily send those cookies right over to you! I'm disappointed my kids didn't care for them, and irritated, oh, SO irritated by that HUGE container hogging up my pantry!